The AFC East may not be the flashiest division this season, but don’t underestimate Buffalo, New York or Miami. All three teams have challenged the Patriots over the past few seasons, and can certainly provide the unnecessary head ache to Patriots coaches, fans and players, especially when they least expect it. However, New England shouldn’t have a problem winning this division, but keep your eyes on the Bills and Jets. 1.) New England Patriots (12-4) – Some analysts believe this team may mimic their record-breaking performance from 2007, while others think they’re a shoe-in for this year’s Super Bowl. In order for the Patriots to be successful, they’ll need rookies Chandler Jones and Dont’a Hightower to pressure opposing quarterbacks and provide all sorts of havoc. 2.) Buffalo Bills (9-7) – The Bills bolted out of the gate last season, but couldn’t maintain their momentum, as injuries and errors derailed their chances of a successful season. This year, Buffalo added Mario Williams and Mark Anderson to their defense, and drafted two potential studs in Cordy Glenn and Stephon Gilmore. The usual cast is back on offense – Ryan Fitzpatrick, Fred Jackson and Steve Johnson, but the main question from last year remains: Can they stay healthy? Also, can they be consistent, too? 3.) New York Jets (7-9) – No offense Jets fans, but your team is in complete disarray. New York didn’t locate the end zone until their fourth preseason game, and there’s still questions surrounding their offense and defense. Yet, probably one of the biggest sagas surrounding this team is when will Rex Ryan swap Tim Tebow for Mark Sanchez? 4.) Miami Dolphins (5-11) – There will be a lot of ups and downs this season for the Dolphins, but expect Miami to conclude their year with at least four or five wins. The New York Jets haven’t won a Super Bowl championship since January of 1969, but Monday’s Tim Tebow press conference certainly provided numerous Gang Green supporters with a great deal of optimism toward the upcoming campaign. Tebow spoke with 200 credentialed media members for roughly 32 minutes on Monday at the Jets practice facility, and fielded questions from why he was “blessed” to be a Jet to his relationship with starting quarterback Mark Sanchez. The young gunslinger also preached about his relationship with the New York coaching staff, which possibly explains why he chose the Big Apple over Jacksonville, Florida. “I’m so honored and humbled to be a Jet. I’m so thankful that they wanted me, and I’m so excited about meeting my teammates,” added the Jets backup quarterback. This particular type of press conference is rather unusual, especially for a backup quarterback, but due to the so-called, “Tebow hype,” as well as his success from last season, it wasn’t too surprising that various media members decided to greet the 24-year-old, as well as question him about joining a team that’s been the doormat to the Super Bowl the past three years in the American Football Conference. “I’m excited to be a Jet – to go out there and help this team anyway that I can, and whatever my role is, however I can expand that role – I’m going to try and do that,” said Tebow. Tebow will certainly be a major asset, especially since head coach Rex Ryan believes that his number will be called roughly 20 times per game. However, don’t anticipate any quarterback swap to occur because as various reports confirmed – Sanchez is going to be the starter once week one arrives. So, whether you like it or not, Tebow is officially a Jet and the excitement for him has definitely drifted from the Rocky Mountains to the city that never sleeps. Numerous sources confirmed at 9PM on Wednesday, March 21, that Tim Tebow is officially headed to the New York Jets. Gang Green also received a seventh round draft pick, while Denver endured a fourth and sixth round selection. Sources and reports confirmed earlier that Tebow had officially been traded to New York, but a later bulletin announced that the Jets front office hadn’t exactly read all of the fine print. Tebow’s contract apparently stated that any suitor who obtained him would have to pay Denver $5 million. And while New York remained at a standstill over this issue, sources then began reporting that Tebow would most likely return to Denver, and then be pursued by Jacksonville and St. Louis. However, the whirlwind officially ended a few hours later when the Broncos and Jets agreed to split the coast, and execute the deal. Tebow started 13 of 18 games last season, which included two postseason contests against New England and Pittsburgh, but will most likely backup Mark Sanchez, who recently signed a three-year extension. According to various sources, it appears Tim Tebow is not officially a member of the New York “Football” Jets due to a recent “snag” in the gunslinger’s contract. As reported by the Denver Post – the Jets front office apparently didn’t realize that Tebow’s contract instructs acquiring suitors to send $5 million back to the Denver Broncos. So, if New York decides to forgo paying the money for Tebow, then he’d return to Denver. ProFootballTalk.com also confirmed that if the trade doesn’t occur then Jacksonville and St. Louis would be interested in acquiring the former Florida Gator signal caller. It’s been a busy day in the NFL. 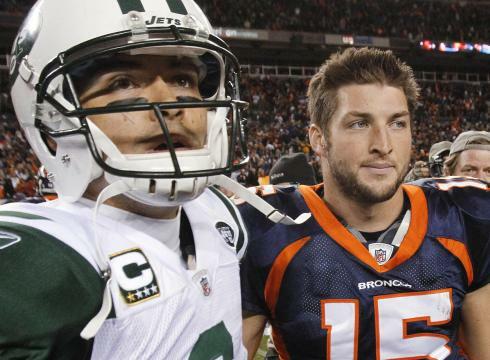 * The Denver Broncos traded quarterback Tim Tebow to the New York Jets in exchange for two draft picks. * The NFL announced that New Orleans Saints head coach Sean Payton would be suspended for the upcoming season without pay due to his team’s bounty program, which began when defensive coordinator Gregg Williams was hired in 2009. Williams has officially be suspended indefinitely, while the team’s GM Mickey Loomis has been suspended for the first eight games of the 2012 season. Also, the Saints will be fined $500,000, too. * Finally, beneath the Tebow trade and league ruling on the Saints – the San Francisco 49ers resigned quarterback Alex Smith to a three-year contract. According to the Associated Press, Smith will earn $8 million per year with $16.5 million guaranteed. So, without further ado – we’d like to know your thoughts on what was the biggest story of the day thus far? Cast your vote below!